In general, I don't drink tequila straight. I will take the occasional shot at a party when someone hands me a lime and a glass, but I don't generally drink straight tequila. Like most of us, I grew up on Jose Cuervo or even the lesser brands. But I have come to appreciate agave spirits, especially after having been introduced to mezcal and sotol. Still, I haven't found a great tequila to drink straight. I can drink Patron, but it doesn't have the range of flavors of whiskeys or rums that I enjoy neat or on a large piece of ice. (Please, send me recommendations or bottles. I'm always open.) So tequila has always remained a mixing spirit for me. And I love drinks with tequila, don't get me wrong. 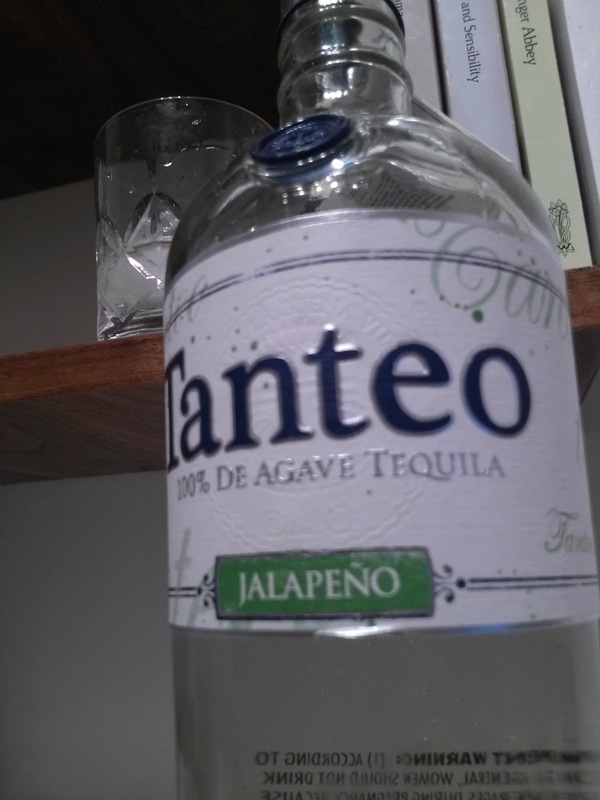 Tanteo 100% de Agave Jalapeno Tequila is changing my perception. It's a blanco tequila, but it has been infused with real jalapenos. They take fresh jalapenos, chop them up, and put them in the tequila. Start with a good blanco tequila, and you have the ability to make greatness. And they have. Even my dad, who has not touched tequila in all of my adult life, in general won't touch any spirit besides a bourbon or scotch, was willing to try it, and he wanted more. This is a man who drank too much tequila in his Air Force days and claims to hate the stuff. He loved the Tanteo Jalapeno version. Me, too. It smells like jalapenos, but not so strong that it makes you gag or anything. And then the taste is bright and sugary, but spicy and citrus-filled, as well. It's like a grapefruit and a jalapeno copulated, and there was Tanteo. Maybe that's not such a nice image, but oh well. I recommend it for tequila drinkers looking for something different, but also for those who claim not to like tequila. It may change their mind. Don't discount it as a mixer, though. 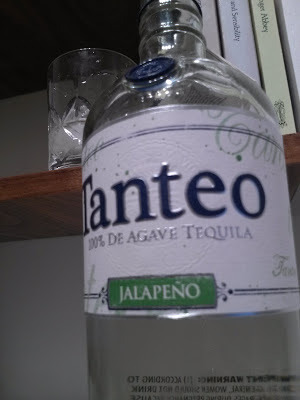 The Tanteo Texas Paloma substituting Tanteo Jalapeno for the regular tequila is so tasty that even my wife liked it. See her review of Absolut Peppar to find out what she normally thinks of spicy liquors. For the Tanteo Texas Paloma recipe and more, see our video here. Oh, and if you looked at the picture above really carefully, the answer is yes, Tanteo goes very well with Jane Austen novels.